Your adventure begins with a boat ride across the beautiful waters of Shasta Lake on a 65 foot catamaran. Your boat captain will speak briefly about Shasta Lake and the geography surrounding the McCloud Arm of the lake, as well as some of the facts about the area. You may even catch a glimpse of a Great American Bald Eagle on your journey! The second adventure is our scenic bus ride. Enjoy the atmosphere of our new custom busses as you ride in comfort to the cavern entrance. Along the way you may spot a Bald Eagle, Osprey, Falcon, Mountain Lion, Bobcat, Black Bear, or Black-Tailed Deer. You will also enjoy the variety of foliage we have here including our native Manzanita, Red Bud, and other examples of exclusive Northern California wildlife. 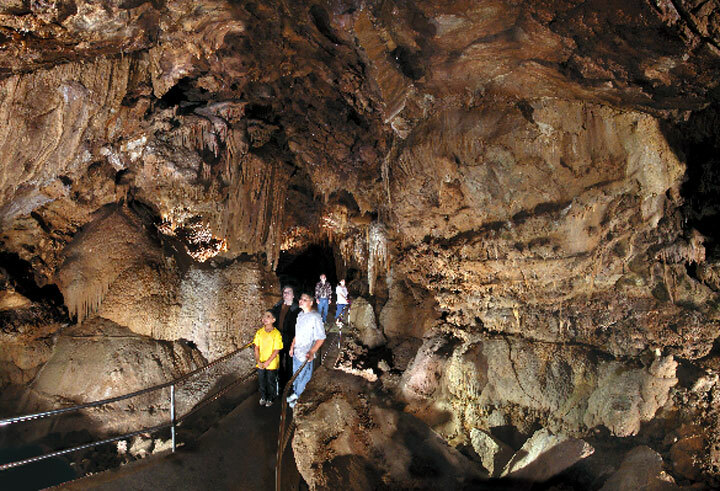 When you reach the cavern entrance your guide will explain the history of the caverns, its discovery, and the formation of limestone caverns. When you enter the caverns you will be in awe at the beauty that surrounds you. As you turn each corner, a different surprise awaits you in the form of beautiful calcite crystal formations! You’ll soon realize you didn’t buy enough film or large enough memory card to capture this wonderful creation of Mother Nature!